Claypool's Confessions: They say that life's a journey... Pilgrims on the road in fact. They say that life's a journey... Pilgrims on the road in fact. This past weekend I walked 25km with Olga, the woman who is in charge of the Foyer International pour Jeunes Filles, where I live, and Bérengère, a new friend who also lives in the Foyer, along with 125 or so other pilgrims. The day began with mass in Moudon--held in a small Protestant church actually that opened their doors to us (quite interesting really--it was a Catholic church pre-Reformation, has been a Protestant church ever since, and they still let us come in). The minister of the church actually gave the sermon, and the main point was "Heureux plutôt ceux qui entendent la parole de Dieux, et qui la gardent! ", a statement Jesus declared to underscore the fact that faith has nothing to do with being a birthright or an inheritance. Rather, it's a personal choice that comes from within, rather than without. It's not just a family upbringing, a mindless routine, something I've been forced to do every Sunday. It's a choice... and I'm grateful that it is that. Following the mass, there was a benediction and a prayer asking for safety for our footsteps... and we all chose to embark. We were asked to spend the first hour in meditation (and that hour flew by!). I thought about and prayed for my grandmother, who had suffered a stroke the day before, and was giving thanks for this adventure I've been granted. Lots of other friends and family were in my thoughts as I was walking... and then the hour was gone, and the walking continued, alternating between quality conversation with newfound friends and comfortable periods of reflection. 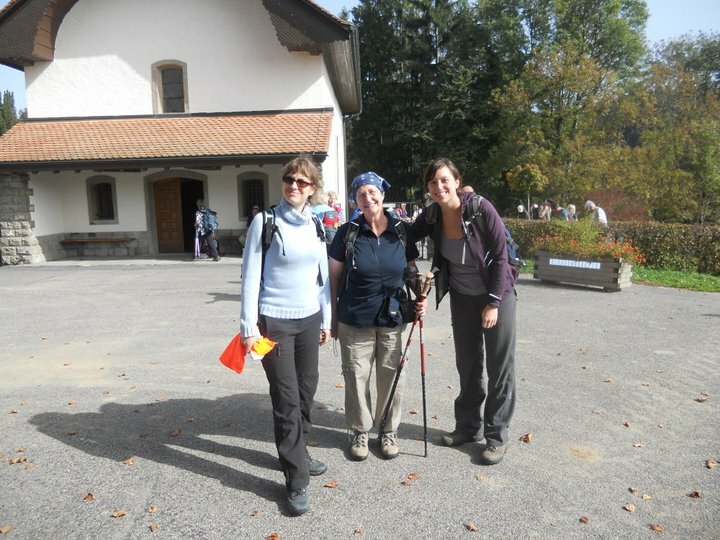 We were tired at the end of the 25km, and there was a closing service at a church in Lausanne before we got on the train to return to Geneva. More time for walking and reflection would have been a good thing... but my growing cold had steadily worsened over the course of the day, and I knew the next day held 14.6km of running. The Run Evasion Rhône race was not my best, in terms of time and comfort. But it was a beautiful trail run through the forest and countryside... I'd like to do the same route again, when I'm healthy. As the first leg of the relay though, I couldn't leave my new friends Carey and John in the lurch! I finished the 9 miles and enjoyed the race considerably, given my state! :) And I have the best European race schwag ever... a beach towel that I will surely use, as opposed to an ill-fitting race t-shirt. Proof that I survived! Both of these journeys called to mind The Servant Song--"We are pilgrims on a journey, we are travelers on the road, we are here to help each other, walk the mile and bear the load."